The clock may be ticking for petrol and diesel-powered cars, but it’s vans, trucks and buses that are driving the electric vehicle revolution on the world’s roads. This week the UK government followed France in announcing it would ban the sale of such vehicles by 2040, while the mayors of Paris, Madrid, Mexico City and Athens plan to banish diesels from their city centres by 2025. Almost all car makers now offer hybrid cars and many sell fully electric vehicles. But the electric charge also extends to vans and trucks, and the need to switch to cleaner engines is even greater given that these larger vehicles are far bigger polluters than cars. “In Europe, less than 5% of vehicles are commercial vehicles or heavy duty trucks, but they contribute to almost 20% of greenhouse gas emissions,” says Ananth Srinivasan, mobility expert with research consultancy Frost & Sullivan. Even in a country with wide open spaces like Australia, the electric wave is rolling out. 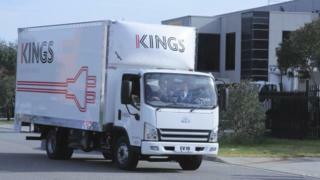 Melbourne-based logistics firm Kings Transport recently bought nine electric vans and light trucks from SEA Automotive. SEA chief executive Tony Fairweather says his firm realised a few years ago that electric commercial vehicles were becoming economically viable much faster than predicted. Beyond Australia, electric commercial vehicles are becoming an increasingly common sight. In Germany, for example, Deutsche Post has started building its own electric vans and will soon start selling them to other companies. Meanwhile, in the US, the city of Los Angeles plans to make its entire bus fleet emissions-free by 2030. The International Energy Agency (IEA) believes that keeping global temperature rises below 2C by the end of the century will in part depend on the electrification of some 600 million vehicles worldwide. Given there are more than 300 million commercial vehicles on the planet’s roads, according to data portal Statista, it is clear that this goal need not be focused solely on passenger cars. SEA’s approach involves fitting its own electric driveline technology to a chassis built by China’s FAW. Big vehicle makers are also developing their own electric systems for commercial vehicles, including Nissan, with its e-NV200 fully electric van. Many light commercial vehicles often travel similar routes every time they leave the depot, Mr Fairweather and others point out. So businesses with depots can invest in installing their own charging stations. “You can get super cheap electricity late at night,” says Simon Evans, deputy editor of Carbon Brief. But if everyone starts charging their trucks and vans overnight, electricity consumption dynamics could change dramatically, he warns. “You are basically sticking a massive great electricity demand into a new place,” he says. If millions of new electric vehicles do hit the road in the coming years, electricity grids around the world will have to adapt. The UK’s National Grid is already evaluating the impact of a potential boom in electric cars. However, the range of electric cars remains an issue. For smaller commercial vehicles travelling those relatively fixed urban routes, that is not too much of a concern. But larger trucks travelling long distances pose a much tougher challenge. Battery technology is still not good enough, although hybrid designs such as the one being tested by Volvo, which allows for intermittent recharging, could help. There are even experiments in which long stretches of road have been electrified with overhead cables to power large trucks en route. Lighter commercial vehicles remain the most likely to go electric in the near term, with the UK leading the way. That seems appropriate given that electric milk floats were once a common early morning sight across the country. Denis Naberezhnykh, of the UK’s Transport Research Laboratory, says the government recently awarded £20m to a wide range of low emission freight and logistics projects – including several electric vehicle ventures. But even without government support, companies and local authorities are already investing in such vehicles. Some London routes now have only electric buses, for example. “There’s a whole bunch in Milton Keynes and Bristol, all over the place there’s really quite a large number of areas committed to the electrification of buses,” says Mr Naberezhnykh. In countries where infrastructure threatens to hold back the introduction of electric vehicles, interesting adaptations are being considered. Take India, for instance, which has an ambitious plan to electrify six million vehicles by 2020. An Indian truck-maker recently proposed a system for simply swapping electric buses’ batteries with fully charged ones to keep them running for longer. But it’s worth remembering that a similar battery-swapping venture for passenger cars, called Better Place, went bust in Israel four years ago after burning through at least $500m (£380m). Other city services seem especially well suited for electrification. One of Mr Fairweather’s upcoming projects at SEA is a new design for electric refuse trucks, which are cropping up in many places. Mr Naberezhnykh says councils in the UK are already expressing interest, partly because electric trucks are much quieter. The first such vehicle went into service in Sacramento, the California state capital, in June. Many governments and businesses around the world are clearly interested in the electrification of commercial vehicles. Some projects may be more tentative than others, but it’s obvious that organisations are taking advantage of their unique position. Unlike most car owners, they can often afford to absorb the initial cost of going electric – and make the business case for fuel savings down the road. Frost & Sullivan’s Ananth Srinivasan says it it easier for freight fleet owners to justify investment in electric vehicles because “when they look at the cost for miles travelled over, say, two years with an electric van versus one powered by petrol or diesel”, the financial benefits are obvious.